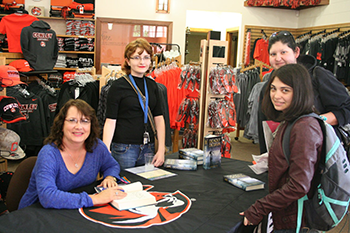 Cowley College adjunct instructor Debra Dockter conducted a book signing for her debut novel, Deadly Design, Monday at the Sid Regnier Bookstore in Arkansas City. Pictured alongside Dockter is her daughter, Sophie. Also pictured are Kaitlyn Moore and Ashley Barron who stopped by to purchase a copy of the book and have them signed by Dockter. Deadly Design is a young adult thriller about genetically engineered identical twins Kyle and Connor McAdams who were born two years apart. Their parents figured it was safer that way, to increase their odds of survival. Connor was born first, paving an impossibly perfect path for Kyle to follow. He was the best at everything—valedictorian, star quarterback etc. Kyle never thought he’d be able to live up, so he didn’t even try. But when Connor, 18, suddenly drops dead of a heart attack, and Kyle learns of other genetically modified kids who’ve also died on their 18th birthdays, he’s suddenly motivated—to save his own life. Like Connor and all the rest, Kyle was conceived at the Genesis Innovations Laboratory, where the mysterious Dr. Mueller conducted experiments on them. The clock’s ticking as Kyle searches for answers: who was Dr. Mueller really, and what did he do to cause their hearts to stop at 18? He must unravel the clues quickly, before, he too, becomes another perfect, blue-eyed corpse.